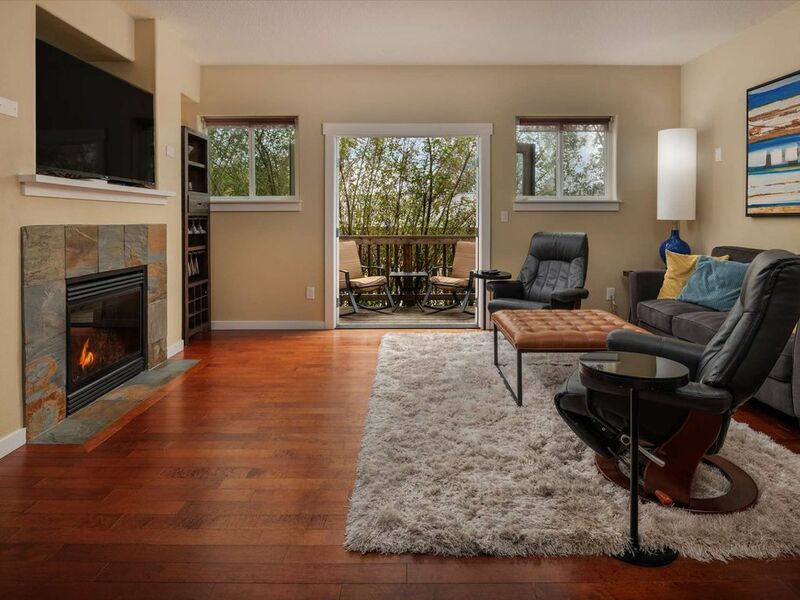 This townhome is centrally located in Southwest Portland close to I5 and 217. You can be downtown in 15 minutes, Lake Oswego in 10 and wine country in less than 30 minutes. The bottom level has a large garage on the ground floor level where most of it has been converted into a casual seating, bar, and billiards area. It is a wonderful place to enjoy a beverage and play some pool with friends and family. The second level is the towhomes main living area. The floor plan is open and joins the living area, kitchen, and dining area all together making fantastic use of space and light. There is a single half bath on this level. The top floor has all three bedrooms which contain one queen bed in the master and two full beds in the other two bedrooms. The master bedroom as an en suite master bathroom with walk-in glass shower. There is an additional full bath down the hall as well. Was here for 3 nights with the family. Very clean. Living room, dining room, & kitchen were spacious. Complimentary wine. Quiet neighbourhood. Kids loved the pool table. Had Netflix & other streaming sites. Loved the walk-in closet in the master bedroom & the big spacious shower in the washroom. Washer & dryer were very conveniently located upstairs. There are supermarkets, restaurants, & the Johns Incredible pizza entertainment centre located nearby & the kids loved it. Again, very clean!! Clean, comfortable house located about 20 minutes from downtown Portland. Was there for a weekend with some friends and would definitely recommend. Clean, comfortable house in a quiet neighborhood about 20 minutes from downtown Portland. Was there for a weekend and would definitely recommend. Quiet neighborhood, easy to find, great location! Clean, comfortable, and wonderful location! This townhouse is spacious and well appointed, full kitchen, laundry, and quite comfortable. It was 8 minutes from our meetings, so it doesn't get much better from our perspective. Thanks for a lovely stay. We would definitely stay again if dates aligned. Everything was "as advertised" with this very nice 3 BR 2.5 BA Townhouse. It's on a quiet street about 20 minutes from downtown Portland. My family of six adults were here for a wedding in Tigard and this worked out perfectly for us, allowing easy access to family in Tigard and Beaverton as well as to fun and interesting places in Portland. The owner was very responsive to our questions in advance of arrival and, in short, we had a great stay.